Must Employers Pay for Snow Days, Rain Days, and Emergencies? When a snow day or other emergency impacts whether your employees work or not, you'll need to consider the legal aspects as well as how your employees will feel about your decision, when deciding to pay them. If you decide not to pay, will you harm employee morale and whether employees will view you as an employer of choice? Employee pay depends on several factors, including whether the employee is exempt or nonexempt, state and federal laws, your employer's policies, and whether the decision to close was voluntary. The Fair Labor Standards Act (FLSA), managed by the U.S. Department of Labor’s (DOL) Wage and Hour Division, governs the legal issues at the federal level. States may have additional rules, so check with your state department of labor or an employment law attorney. According to the DOL, if you close because of inclement weather such as rain, snow, or other emergencies and the employee has worked that week, that person must be paid their full, normal salary. You may not take deductions from exempt employees' pay for absences you caused or that were caused by the operating requirements of the business if the employee is willing and able to work. If the weather is worsening and state or local officials have declared a state of emergency and you decide to close part way through a day, you must pay exempt employees their full salary. Even if no emergency was declared and you close out of concern for your employees, you may not dock pay. If an exempt employee chooses to take time off during a rainy day, snow day, or another emergency, and your business is open, you may require that the employee use vacation time, paid time off, or other accrued paid leave. If the exempt employee is not yet eligible to use accrued paid leave, you may take a salary deduction for a whole day of work missed. Another option is to ask employees to work from home if they feel unsafe coming into work. If the employee does work from home, you should not require the use of paid time off. Due to inclement weather, schools, daycare providers, and other services also close. A parent who is unable to work from home should use paid time off. Working at home involves an element of trust, although managers used to supervising teleworking employees are likely less concerned about whether an employee is working. A teleworking policy that covers employee availability, communication, and more is helpful for employees and managers. The DOL rules are different for nonexempt, or hourly, employees. Generally, if a nonexempt employee does not come to work for whatever reason, you do not need to pay him. If you close the business for a day due to rain, snow, or another emergency, you do not have to pay nonexempt employees. Remember, however, that employees are missing work for reasons out of their control. Consider paying employees for the day or part of the day. This gesture cements relationships and effectively communicates that you are committed to your employees' well-being. However, if you close the company part way through a day, you do have to pay nonexempt employees for hours worked. In some states, an employer must pay employees a minimum number of hours if they have reported for work. Know the laws that govern the jurisdiction in which your company is located. 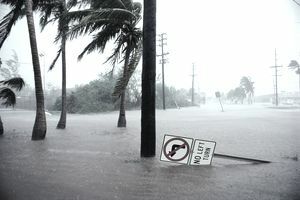 An inclement weather or other emergency policy not only lets employees know what to expect when inclement weather or other emergencies occur, but it gives managers guidance in making the call about closing for inclement weather.